What’s with all the naked people riding through the streets of Portland every summer? 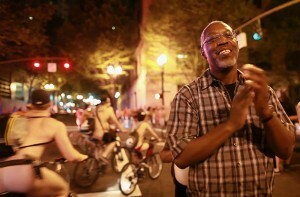 The Bare As You Dare documentary follows several unlikely-to-get-naked cyclists as they forgo their clothes and ride with thousands of people on the Portland World Naked Ride. The film by Ian McCluskey and a crew of assistants from NW Documentary premieres during the Bicycle Dreams program at the 11th Annual Filmed by Bike. This 17 minute piece follows a variety of subjects from a cancer survivor to a reserved homebody, who are surprisingly open in sharing their personal stories and motivation for participation. Take a peek at this impressive documentary, watch the trailer >>. World Naked Rides started as a demonstration against excessive dependence on oil, but have quickly spread around the globe as celebrations of the freedom of bicycling. Portland’s annual ride, founded in 2002, is widely regarded as the largest in the nation, though the numbers have not yet been verified. Organizers hope to get an official count at the next ride this June.